Fox Lake (Oakland County) is a shallow, 9 acre, lowland lake characterized by heavy muck, prolific plant growth, and stagnant, eutrophic water. The property owners of Fox Lake desired to reduce plant growth and muck levels to facilitate better aesthetics and an improved fishery. Installation of Airmax® Aeration Sytems (2 PS40’s and 1 SW40) occurred in April of 2014 to circulate the water and deliver oxygen to the supplemental bacteria (Airmax MuckAway™ TL) that was applied throughout the summer. Muck levels were measured 4 times throughout the summer using a Sludge Judge™ and a grid sampling system. Muck levels showed a generally decreasing trend, resulting in a final average muck reduction of 6.35 inches. In 2013, the owners of Fox Lake contacted The Pond Guy, Inc. to begin reclaiming the water body from the excessive weed growth and muck that had consumed it. 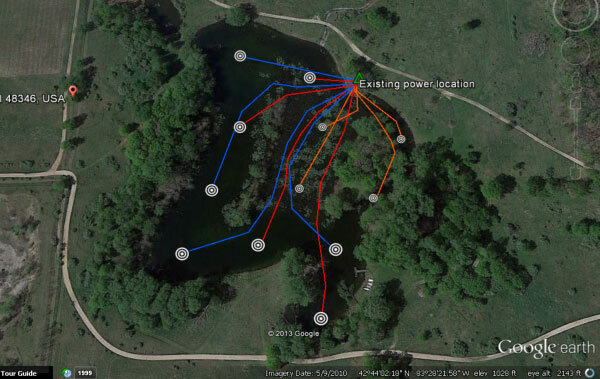 To regain control and return the lake to an aesthetically pleasing and fishable lake, The Pond Guy, Inc. created a best management plan (BMP) for implementation. Following chemical treatments during the summer of 2013, the installation of an Airmax Aeration system was completed in the spring of 2014 (Figure 1.1). The aeration system was designed to turn over Fox Lake once per day to create an optimal oxygenated environment for aerobic bacteria to begin reducing muck on the bottom of the lake. 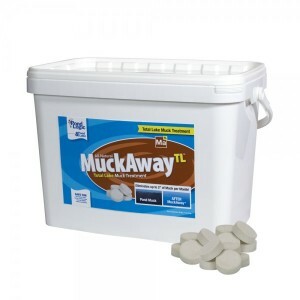 MuckAway TL bacteria, a blend of aerobic bacteria was added to the pond during the 2014 summer to accelerate muck reductions and remove available nutrients from the system. Pond Logic® Pond Dye and a chemical treatment program rounded out the program to address aesthetics and nuisance weed blooms (milfoil/curly leaf pondweed). Because muck reduction was one of the primary goals of the landowner, a sampling method was established to quantify changes in the lake-bed. To measure muck reduction, a Sludge Judge was used to estimate the depth of muck in each of 12 quadrants within Fox Lake. 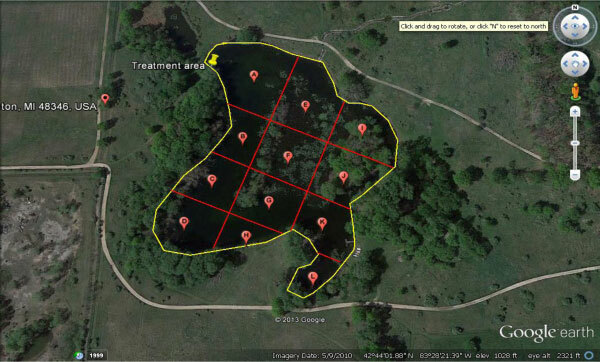 Within each quadrant, 2 sample locations were chosen by random chance to quantify the depth of muck. At each sample location within the quadrant, the Sludge Judge was deployed 3 times and an average of the 3 deployments was recorded as a single data point. To deploy the Sludge Judge the user simply allows the instrument to free fall through the water column, and sink on its own into the muck. At its furthest depth, the surface of the water is recorded on the instrument. After an abrupt pull upwards (to close the foot valve) the Sludge Judge is pulled out of the water and the depth of the muck within the column is recorded. Overall, 72 individual samples were collected onsite per sampling event (Each muck depth in Figure 1.1 is the average of 3 separate readings). Figure 1.3 below shows the average of these 72 samples per event fitted to a trend-line to show the overall direction of the Summer’s study. By subtracting the overall final average from 11/7 from the overall beginning average on 5/13/14, we see that the total average muck reduction was .53 feet (6.35 inches). The science of muck reduction is a largely un-investigated area. 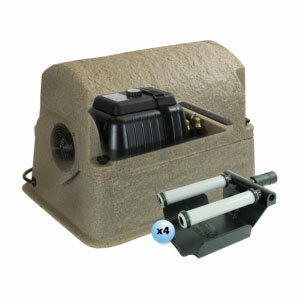 Following good theory and quality product development, pond product companies such as The Pond Guy, Inc. have produced a set of products that have many good qualitative reviews. Quantifying these reviews has been a challenge, which is why there was a need to analyze Fox Lake scientifically. In summary, it is very probable that the management practices (particularly the aeration and bacterial augmentation) of The Pond Guy, Inc. contributed to the over 6” muck reduction during the summer of 2014. 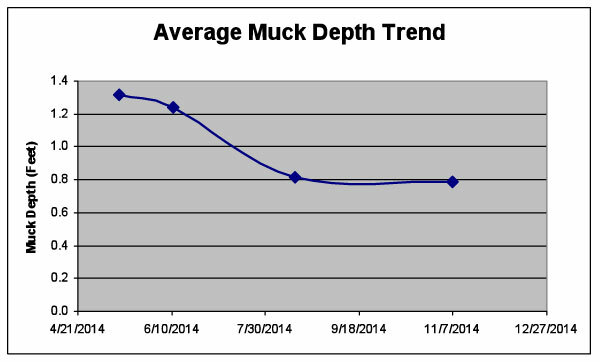 The most dramatic decline in muck seems to coincide with the beginning of the MuckAway TL applications (application started in late May 2014). Further sampling would be required to eliminate variation by seasonal factors. Also, future studies could include composition of the muck to determine what portions are being removed. It should be noted that during the summer of 2014, some large and uncharacteristic algae blooms occurred. It is hypothesized that due to the new circulation (aeration installed) and the interruption of nutrient cycles (bacterial augmentation), there arose opportunities for fast-growing green algaes to capitalize on large amounts of nutrients being cycled out of the system. It is also hypothesized that as the substrate reduces nutrients and the Fox Lake system finds a new balance, there will be fewer nuisance algae blooms throughout the summers. From spring 2013 to fall 2014, Fox Lake has seen overall large improvements in aesthetics and fishing access. Future seasons should see similar reductions in nutrients and improvements in muck depths. Once treatment area is established, calculate treatment amount. For single treatment areas larger than two surface acres, treat every 4 weeks. For treatment areas less than two surface acres, treatments will be required every 2 weeks for best results. APPLICATION RATE: 12 lbs per surface acre. WHEN TO APPLY: Apply monthly when water temperatures are above 50ºF. HOW TO APPLY: Broadcast evenly over the treatment area. How To Apply MuckAway TL: Broadcast MuckAway TL evenly over the treatment area using the included scoop or a spreader. 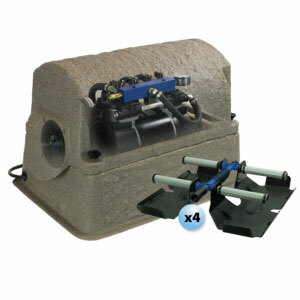 When To Apply MuckAway TL: Apply MuckAway TL every 2-4 weeks when water temperatures are above 50°F. Treatment should continue until desired results are achieved.